Epoxy flooring is tough and resilient and is able to handle the pressure from very heavy equipment, such as cars, trucks, forklifts, and stacked crates. That is why it is such a popular material for hard-working commercial areas, such as garages and warehouses. 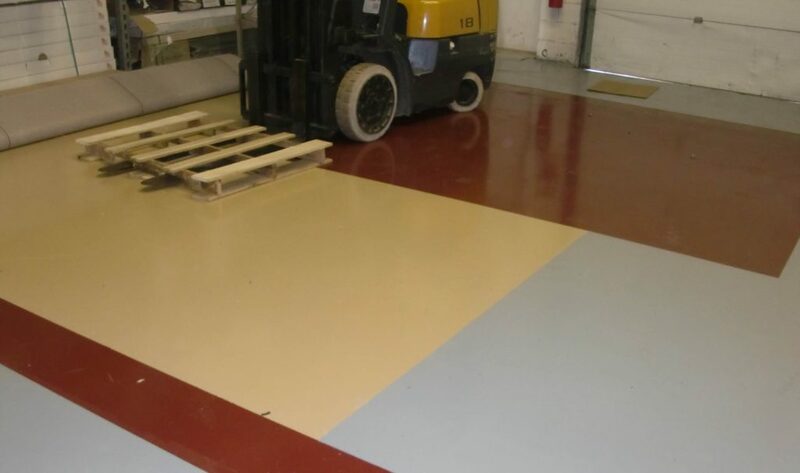 This industrial flooring option can withstand daily abuse from a wide variety of equipment and manufacturing processes. As an abrasion and chemical-resistant material, concrete flooring meets the durability needs of almost all industrial manufacturers. Many warehouses and industrial buildings rely on concrete floors to maintain clean and safe conditions for workers, equipment, and inventory. Industrial floors creates a shiny high-gloss surface that is durable and easy to clean, provides a chemically resistant surface ideal for manufacturing plants and also resists oil stains and water. They can easily handle a foot traffic to truck and forklift traffic.